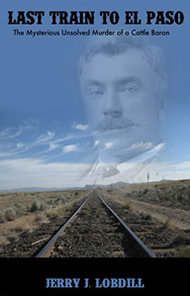 The evening train from Deming pulled into Union Station in El Paso on time at 10:00 p.m. on May 17, 1917. The weather was clear and drier than usual for May. The sun had set at 6:57; twilight had lingered until 7:23, and now only starlight illuminated the area beyond the Union Depot platform. The waning moon would not rise until 3:10 a.m. The train rolled slowly to a stop, and the locomotive steam pressure was released with a hiss and a white plume shooting across the platform. Two men stepped off the train with their bags and entered the station. As they walked through the waiting room, a middle-aged man in a suit and hat approached them and spoke to the older gentleman, who was dressed in a brown suit and white Panama hat. He said, "Hello, Mr. Lyons. I have a car here and will take you uptown." Thomas Lyons stopped to talk with the man who had addressed him. His traveling companion proceeded on toward the street and turned to wave at Lyons. The older man called out, "I'll see you in the morning, John." That was the last time anyone ever saw Thomas Lyons alive.